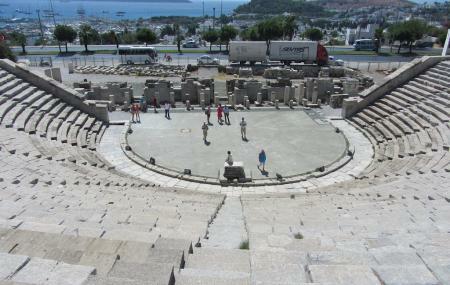 Accredited to the reign of King Mausolus, the Bodrum amphitheatre was completed in the Roman era. One of the best preserved structure of the ancient Halikarnasas, its construction began around 4th century BC. It was later enlarged in 2nd century AD by the Romans. It has three main parts- the stage, the orchestra and the audience seating area. It has a seating capacity of 13,000. Operating as an open air museum, the theatre hosts shows and concerts in summer and is also used as a part of September festival. The schedule of the shows and concerts can be obtained locally. How popular is Bodrum Amphitheatre? People normally club together Mausoleum At Halicarnassus and Pedasa Antique City while planning their visit to Bodrum Amphitheatre.